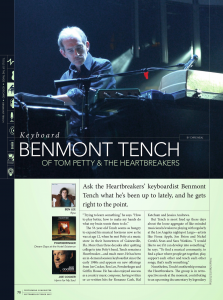 Ask the Heartbreakers' keyboardist Benmont Tench what he's been up to lately, and he gets right to the point. "Trying to learn something," he says. "How to play better, how to make my hands do what my brain wants them to do." The 53-year-old Tench seems as hungry to expand his musical horizons now as he was at age 12, when he met Petty at a music store in their hometown of Gainesville, Fla. More than three decades after quitting college to join Petty's band, Tench remains a Heartbreaker -- and much more. 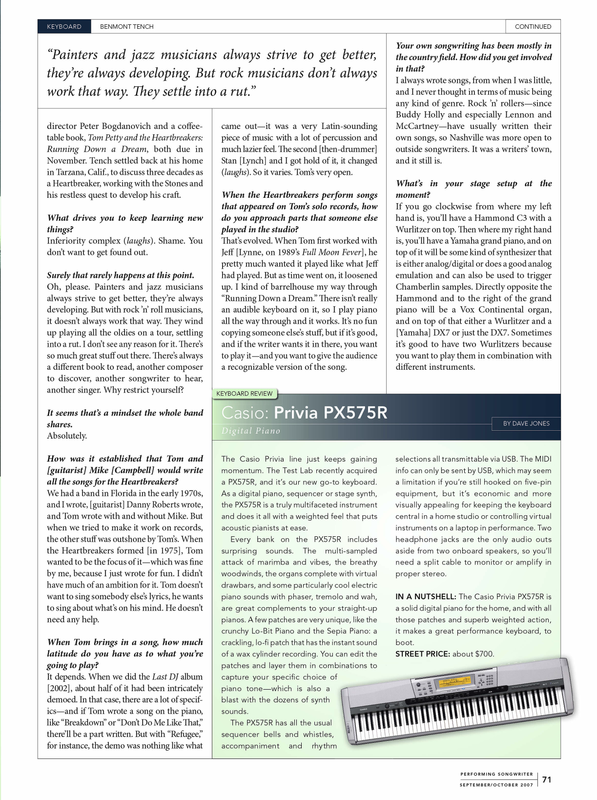 He has been an in-demand session keyboardist since the early 1980s and appears on new offerings from Joe Cocker, Ben Lee, Powderfinger and Griffin House. He has also enjoyed success as a country music composer, having written or co-written hits for Rosanne Cash, Hal Ketchum and Jessica Andrews. But Tench is most fired up these days about the loose aggregate of like-minded musicians he's taken to playing with regularly at the Los Angeles nightspot Largo -- artists like Fiona Apple, Jon Brion and Nickel Creek's Sean and Sara Watkins. "I would like to see if it can develop into something," he says. "To find a musical community, to find a place where people get together, play, support each other, and teach each other songs, that's really something." Nonetheless, Tench's mothership remains the Heartbreakers. The group is in retrospective mode at the moment, contributing to an upcoming documentary by legendary director Peter Bogdanovich and a coffee-table book, Tom Petty and the Heartbreakers: Running Down a Dream, both due in November. Tench settled back at his home in Tarzana, Calif., to discuss three decades as a Heartbreaker, working with the Stones and his restless quest to develop his craft. What drives you to keep learning new things? Inferiority complex (laughs). Shame. You don't want to get found out. Surely that rarely happens at this point. Oh, please. Painters and jazz musicians always strive to get better, they're always developing. But with rock 'n' roll musicians, it doesn't always work that way. They wind up playing all the oldies on a tour, settling into a rut. I don't see any reason for it. There's so much great stuff out there. There's always a different book to read, another composer to discover, another songwriter to hear, another singer. Why restrict yourself? It seems that's a mindset the whole band shares. 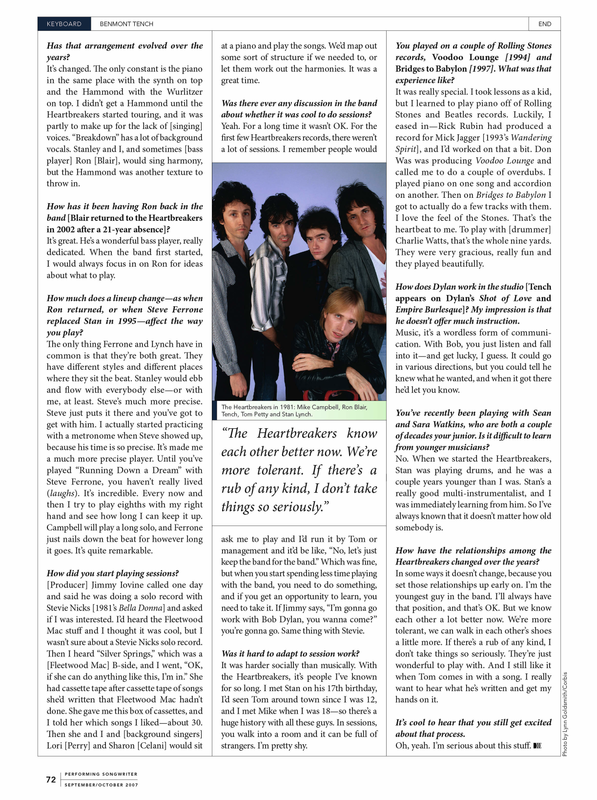 How was it established that Tom and [guitarist] Mike [Campbell] would write all the songs for the Heartbreakers? We had a band in Florida in the early 1970s, and I wrote, [guitarist] Danny Roberts wrote, and Tom wrote with and without Mike. But when we tried to make it work on records, the other stuff was outshone by Tom's. 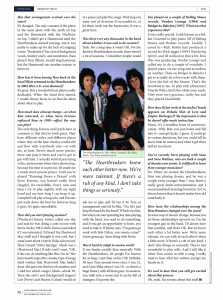 When the Heartbreakers formed [in 1975], Tom wanted to be the focus of it -- which was fine by me, because I just wrote for fun. I didn't have much of an ambition for it. Tom doesn't want to sing somebody else's lyrics, he wants to sing about what's on his mind. He doesn't need any help. When Tom brings in a song, how much latitude do you have as to what you're going to play? It depends. When we did the Last DJ album , about half of it had been intricately demoed. In that case, there are a lot of specifics -- and if Tom wrote a song on the piano, like "Breakdown" or "Don't Do Me Like That," there'll be a part written. But with "Refugee," for instance, the demo was nothing like what came out -- it was a very Latin-sounding piece of music with a lot of percussion and much lazier feel. The second [then-drummer] Stan [Lynch] and I got hold of it, it changed (laughs). So it varies. Tom's very open. When the Heartbreakers perform songs that appeared on Tom's solo records, how do you approach parts that someone else played in the studio? That's evolved. When Tom first worked with Jeff [Lynne, on 1989's Full Moon Fever], he pretty much wanted it played like what Jeff had played. But as time went on, it loosened up. I kind of barrelhouse my way through "Running Down a Dream." There isn't really an audible keyboard on it, so I play piano all the way through and it works. It's no fun copying someone else's stuff, but if it's good, and if the writer wants it in there, you want to play it -- and you want to give the audience a recognizable version of the song. Your own songwriting has been mostly in the country field. How did you get involved in that? I always wrote songs, from when I was little, and I never thought in terms of music being any kind of genre. Rock 'n' rollers -- since Buddy Holly and especially Lennon and McCartney -- have usually written their own songs, so Nashville was more open to outside songwriters. It was a writers' town, and still is. What's in your stage setup at the moment? If you go clockwise from where my left hand is, you'll have a Hammond C3 with a Wurlitzer on top. Then where my right hand is, you'll have a Yamaha grand piano, and on top of it will be some kind of synthesizer that is either analog/digital or does a good analog emulation and can also be used to trigger Chamberlin samples. Directly opposite the Hammond and to the right of the grand piano will be a Vox Continental organ, and on top of that either a Wurlitzer and a [Yamaha] DX7 or just the DX7. Sometimes it's good to have two Wurltizers because you want to play them in combination with different instruments. Has the arrangement evolved over the years? It's changed. The only constant is the piano in the same place with the synth on top and the Hammond with the Wurlitzer on top. I didn't get a Hammond until the Heartbreakers started touring, and it was partly to make up for the lack of [singing] voices. "Breakdown" has a lot of background vocals. Stanley and I, and sometimes [bass player] Ron [Blair], would sing harmony, but the Hammond was another texture to throw in. How has it been having Ron back in the band [Blair returned to the Heartbreakers in 2002 after a 21-year absence]? It's great. He's a wonderful bass player, really dedicated. When the band first started, I would always focus on Ron for ideas about what to play. How much does a lineup change -- as when Ron returned, or when Steve Ferrone replaced Stan in 1995 -- affect the way you play? The only thing Ferrone and Lynch have in common is that they're both great. They have different styles and different places where they sit the beat. Stanley would ebb and flow with everybody else -- or with me, at least. Steve's much more precise. Steve just puts it there and you've got to get with him. I actually started practicing with a metronome when Steve showed up, because his time is so precise. It's made me a much more precise player. Until you've played "Running Down a Dream" with Steve Ferrone, you haven't really lived (laughs). It's incredible. Every now and then I try to play eighths with my right hand and see how long I can keep it up. Campbell will play a long solo, and Ferrone just nails down the beat for however long it goes. It's quite remarkable. How did you start playing sessions? [Producer] Jimmy Iovine called one day and said he was doing a solo record with Stevie Nicks [1981's Bella Donna] and asked if I was interested. I'd heard the Fleetwood Mac stuff and I thought it was cool, but I wasn't sure about a Stevie Nicks solo record. Then I heard "Silver Springs," which was a [Fleetwood Mac] B-side, and I went, "OK, if she can do anything like this, I'm in." She had cassette tape after cassette tape of songs she'd written that Fleetwood Mac hadn't done. She gave me this box of cassettes, and I told her which songs I liked -- about 30. Then she and I and [background singers] Lori [Perry] and Sharon [Celani] would sit at a piano and play the songs. We'd map out some sort of structure if we needed to, or let them work out the harmonies. It was a great time. Was there ever any discussion in the band about whether it was cool to do sessions? Yeah. For a long time it wasn't OK. For the first few Heartbreakers records, there weren't a lot of sessions. I remember people would ask me to play and I'd run it by Tom or management and it'd be like, "No, let's just keep the band for the band." Which was fine, but when you start spending less time playing with the band, you need to do something, and if you get an opportunity to learn, you need to take it. If Jimmy says, "I'm gonna go work with Bob Dylan, you wanna come?" you're gonna go. Same thing with Stevie. Was it hard to adapt to session work? It was harder socially than musically. With the Heartbreakers, it's people I've known for so long. I met Stan on his 17th birthday, I'd seen Tom around town since I was 12, and I met Mike when I was 18 -- so there's a huge history with all these guys. In sessions, you walk into a room and it can be full of strangers. I'm pretty shy. You played on a couple of Rolling Stones records, Voodoo Lounge (1994) and Bridges to Babylon (1997). What was that experience like? It was really special. I took lessons as a kid, but I learned to play piano off of Rolling Stones and Beatles records. Luckily, I eased in -- Rick Rubin had produced a record for Mick Jagger [1993's Wandering Spirit], and I'd worked on that a bit. Don Was was producing Voodoo Lounge and called me to do a couple of overdubs. I played piano on one some and accordion on another. Then on Bridges to Babylon I got to actually do a few tracks with them. I love the feel of the Stones. That's the heartbeat to me. To play with [drummer] Charlie Watts, that's the whole nine yards. They were very gracious, really fun, and they played beautifully. How does Dylan work in the studio [Tench appears on Dylan's Shot of Love and Empire Burlesque]? My impression is that he doesn't offer much instruction. Music, it's a wordless form of communication. With Bob, you just listen and fall into it -- and get lucky, I guess. It could go in various directions, but you could tell he knew what he wanted, and when it got there he'd let you know. You've recently been playing with Sean and Sara Watkins, who are both a couple of decades your junior. 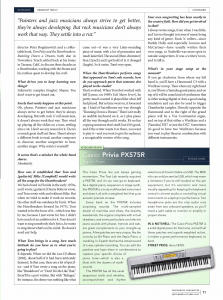 Is it difficult to learn from younger musicians? No. When we started the Heartbreakers, Stan was playing drums, and he was a couple years younger than I was. Stan's a really good multi-instrumentalist, and I was immediately learning from him. So I've always known that it doesn't matter how old somebody is. How have the relationships among the Heartbreakers changed over the years. In some ways it doesn't change, because you set those relationships up early on. I'm the youngest guy in the band. I'll always have that position, and that's OK. But we know each other a lot better now. We're more tolerant, we can walk in each other's shoes a little more. If there's a rub of any kind, I don't take things so seriously. They're just wonderful to play with. And I still like it when Tom comes in with a song. I really want to hear what he's written and get my hands on it. It's cool to hear that you still get excited about that process. Oh, yeah. I'm serious about this stuff.